It is easy to forget, with his recent movies and the direction he has taken his career, that Michael Bay is a very good action director with some great films to his name. One example of that is The Rock, a movie which demonstrates how to effectively make an action movie. For starters, the cast is fantastic. The opening sequence introduces our great villain: heavyweight and reliable supporting cast member Ed Harris. The fact that he is the “bad guy” manages to add credibility and his motive is one that you can understand. Harris isn’t evil for the sake of it, he is respected, his motives are honourable and his plan is a creative one. The opposite side of that is our “heroes;” Nicholas Cage and Sean Connery. It is a bizarre pairing but one that works fantastically. Cage is as unhinged as ever, shouting his great lines and looking the perfect amount of exasperated. This movie is an example of what Cage can do best, before he made the bizarre film choices he seems to churn out with disregard today. Connery is the real star though. He manages to ooze the same amount of cool he did when he donned the tuxedo as James Bond. His one-liners, his moments of action and the smirk he gives Harris when they have their one scene together demonstrates why he is acting royalty and also why he is sorely missed from the movie screens today. Connery’s character is also key to the plot which is a very good one for an action movie. These sorts of films always work best when they have a high concept and the idea of Harris’ villain using disused prison Alcatraz as a base for hostages is one which offers plenty of potential. Connery being the only man who has broken out and subsequently the only one who can break back in, offers plenty of great on-screen opportunities, one good example being Connery’s daring trip through the boiler vents. These set-pieces, be them small and tense or large and chaotic, is what Bay has become synonymous with and that isn’t necessarily a bad thing. The Rock isn’t full of mindless action and carnage for no reason but the sequences are the most explosive they could be. Car chases through the San Francisco streets or gunfights in the abandoned halls of the prison, all present great action sequences which are staged well and clearly. The last perfect ingredient for a great action movie is one that doesn’t take itself too seriously. 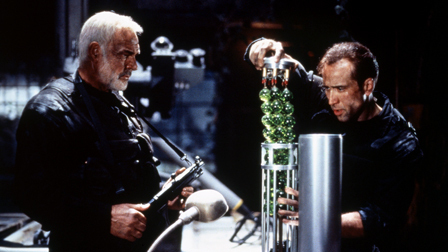 There are some great one-liners and humour throughout the movie, especially from Cage and Connery. It makes the movie light and easy to watch. That doesn’t mean there isn’t a darker tone and The Rock offers something that is missing from action movies today, a harder, more mature edge. The Rock could well be made today but it would be toned down in violence and language to make it more accessible to the PG13 (UK 12A) market. Watching this nineties classic makes you realise how much we are missing a harder edge to our action heroes. Overall, The Rock is Michael Bay at his action best. It is a movie with great action sequences, a high-concept plot with plenty of potential and a cast which handles these ingredients perfectly. Connery and Cage are at their best, delivering a script of funny one-liners and cooler moments. There’s a (relatively sane) theory that Connery plays Bond in this film. Disavowed by Britain, left to rot in the ‘states for 30 years without charges in their highest security prisons… total badass… it’s all there. I loved this film, like you say – easy to forget that Bay used to be respectable, and made good films. That makes so much sense. It will also increase my enjoyment of the movie even more. A very cool theory. love this movie! time for a re-watch! thanks. great review, this one is The Connery show, all the way hands down! Previous Previous post: Did Point Break need to be a remake?